Real-time Big Data Analytics initiatives are being discussed in boardrooms around the globe. 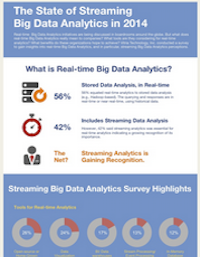 In April of 2014, Vitria Technology, Inc. conducted a survey to gain some insight into real-time Big Data Analytics, and in particular, streaming Big Data Analytics perceptions. What does real-time Big Data Analytics really mean to companies? 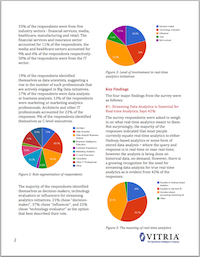 What tools are companies considering for real-time analytics? What benefits do these organizations hope to achieve? And most importantly, are these organizations ready for these initiatives?